It’s hard to blame them. Only the most miserable among us seek to wallow in epic failure, whether it be individual or collective, past or present. 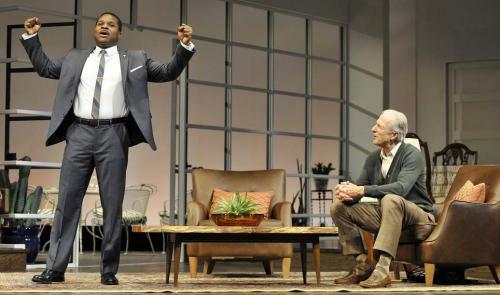 So often, then, it’s left to the people on stage and screen to “start a dialogue” or to just muse privately about how race — and racism— play out in our private lives. The Huntington Theatre Company’s adaptation of the 1967 film “Guess Who’s Coming to Dinner” has given us that option, should we choose to accept it. And, in this case, we should. Not only is the performance itself a fun night out (it is, for the most part, a comedy), but it also comes at an opportune moment here in Boston as we mark 40 years since the desegregation order that sought to end decades of blatant discrimination in the city’s schools. If busing-era white Boston could find itself personified in a single fictional character, a good consensus candidate might be this play’s “Matt Drayton.” A left-leaning newspaper editor who raises a beautiful, open-minded daughter, Drayton is flummoxed when her new beau turns up — both unexpectedly and in an unexpected form— as “Dr. John Prentice,” played by the former Cosby Show actor Malcolm-Jamal Warner. Warner’s Dr. Prentice is a renowned physician and author who has recently met and fallen in love with a younger Joanne ‘Joey’ Drayton during her recent hospital internship in Hawaii. When the couple swoops in for a surprise visit to the Draytons’ hilltop manse in San Francisco, “the reveal” leaves Matt Drayton and his wife dazed, confused, and lunging for the liquor cabinet. Not only is their daughter’s love interest a black man, but the newly unveiled couple-to-be demand the parents’ blessing on the spot for a hurry-up wedding. There’ll be no extended courtship for these two; it’s straight to the altar or bust. And the decision, the parents learn to their chagrin, is theirs to make within a matter of hours, as the doctor is heading off in the morning for a new job in Europe. The shock, coupled with the ultimatum, tests the Draytons’ nerves and ideology. Never mind that Matt treats his cranky black maid like a favored aunt. Miss Matilda takes her uniform off and goes home to her own family after serving up the Draytons’ chicken dinner each night. And that’s just the way the world is supposed to be for a proper American household, liberal or not. Even ole Miss Matilda agrees. Or so it seems. The Huntington’s Matt Drayton is superbly played by Will Lyman, the award-winning actor whose voice will resonate to audiences as the longtime narrator of the PBS documentary series “Frontline.” His struggle first to grasp the gravity of the situation and then to maintain his temper and dignity — even as his daughter ratchets up the pressure on everyone — drives the story. Will he swallow hard, give them his blessing, and thus salvage his relationship with only child? Or will he Bunker-down, Archie-style, and cling to his legitimate fears of what a 1967 America will mean for this couple and their children. As the father of four children and the white husband of a black woman, I found myself naturally drawn to the beleaguered dads, especially Drayton, a more fully drawn and resolved character. I gasped — not at the audacity of bringing home an unexpected black man, but at bringing home any stranger with an expectation of an expedited blessing. You best believe: Any child of mine ever tries that mess, they’ll be begging for Matt Drayton, warts and all. Perhaps we can be forgiven if we deep down empathize a little more than expected with one of the flabbergasted parents. Since it is a period piece— and not a firehose feed from Ferguson, Missouri, or some other contemporary race-infused crisis— this updated “Guess Who’s Coming to Dinner” gives us the wiggle room we need to chuckle and cringe and identify. That’s a good and a welcome opportunity. The redemptive nature of the story, after all, is not that we steel ourselves against prejudice; we all have our biases and hang-ups. It's about how we comport ourselves— individually or as a people— as we are faced with the very real changes around our dining room tables. Would that we would all approach it with the wisdom and grace of the Drayton family. What a world that would be. “Guess Who’s Coming to Dinner” runs through Oct. 5 at the Avenue of the Arts/BU Theatre on Huntington Ave. See huntingtontheatre.org for tickets and performance times.